Safety Was On The Mind Of The Engineers Behind The 2019 Ram 1500 | Bill Howich Chrysler Ltd. There are many aspects of a new pickup truck that need to be considered to determine if it's the right choice in a new vehicle. While performance is often the first thing that most drivers considered, safety features are just as important if not more so. The 2019 Ram 1500 is a pickup truck with a multitude of safety options that drivers can feel easy having at their disposal. A world of useful knowledge about the Ram 1500 awaits you at Bill Howich Chrysler Ltd. Once there, you'll be able to get a closer look at the advanced airbag technology built into this vehicle. 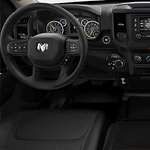 The Ram 1500 is lined with six standard airbags along with the front driver and passenger airbags that are equipped with adaptive venting technology. Together these airbags provide maximum protection to vehicle occupants. You'll get better stops while driving around Campbell River due to the largest in class 14.9-inch brakes that come with the Ram 1500. These brakes bring the vehicle's occupants and whatever payload that is being carried to a complete stop in shorter distances.